It’s BLUE DEVIL WEEK here at Once Upon a Geek! In the grand tradition of FLASH WEEK and AQUAMAN WEEK, we’ll be exploring another of my top five favorite superheroes this week. And to finish it off on Friday we’ll feature an exclusive ONCE UPON A GEEK interview with the Blue Devil creators! A blast of supernatural energy trapped Dan Cassidy — special effects master and stuntman supreme — in the skin of his greatest contraption! Forever after he would be an honest-to-goodness Blue Devil! That was the brief description at the start of most issues of Blue Devil. It was a good recap, but it didn’t capture how funny and endearing the character was. One of Blue Devil’s greatest traits is that he’s a regular guy. Regardless of how crazy the situation is around him, you can count on Blue Devil to provide a perspective you can relate to. Whether we’re talking about the original Blue Devil series or the more recent Shadowpact series, he’s always maintained a Jimmy Stewart-like quality. He’s the guy whose situation has spiraled out of his control, and yet he’s still struggling to do the right thing. The humor that Blue Devil is known for typically comes from these outlandish situations and his responses. In fact, that’s when Blue Devil works best in a comic; when he can spout off a bunch of one-liners in response to the insanity he’s caught up in. Another reason I like Blue Devil is that I got in on the ground floor. I picked up issue #1 off the shelf in 1984. Here was a brand new hero that was funny and I could relate to! I didn’t need to know 40 years of continuity and I felt like I was blazing my own trail of fandom (rather than just following the herds to Uncanny X-Men or New Teen Titans). It felt like I was cheering for the underdog. Finally, Blue Devil just looks cool. Paris Cullins work on the first six issues of Blue Devil is downright phenomenal. Cullins has an incredible sense for layout & storytelling, and has a way of making static figures look dynamic & fun. In Shadowpact, they redesigned Blue Devil’s look and gave his costume a much more “regular guy” appearance. The new look of a t-shirt and pants really works for Blue Devil. Now the look Blue Devil sported during his JLA years should be forgotten (1995-2005). Yuck. The much-beloved Blue Devil monthly series lasted 31 issues and one annual (1984-1986). 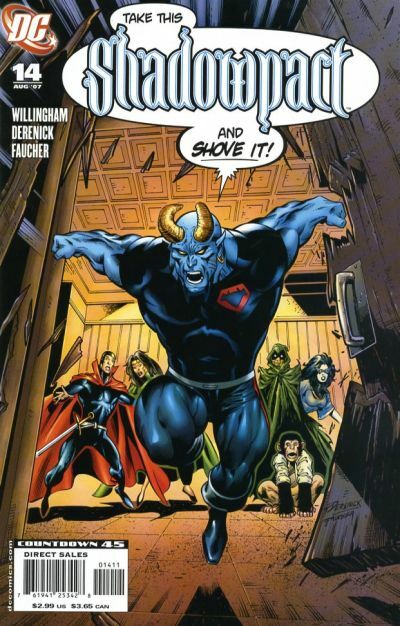 Blue Devil was created by the writing team of Dan Mishkin and Gary Cohn, and they did the entire Blue Devil monthly series. In that series, Dan Cassidy’s powers came from the amalgamation of his stunt suit technology and the sorcery bestowed upon him by the demon Nebiros. While he used his powers to help people, he was always the reluctant hero. He would rather have found a way to remove the costume that had become grafted to his body. After that, Blue Devil dropped off the radar for about seven years until he reappeared in a six-part story in Showcase ’93, again written by Mishkin & Cohn. He later joined the Justice League America (1995-1996) written by Gerald Jones. During the Underworld Unleashed crossover (1995), he made a deal with the demon Neron for fortune and fame. This deal resulted in a drastic transformation for Blue Devil into a true devil; he was no longer just a human in a suit. During this period he joined up with the Sentinels of Magic, and found himself roaming the Earth with Lucifer’s Trident banishing escaped demons back to Hell. Blue Devil returned to the spotlight in the excellent Day of Vengeance (2005) mini-series by Bill Willingham. This led to a fantastic spin-off called Shadowpact that was written by Bill Willingham and Matt Sturges. Shadowpact lasted 25 issues (2006-2008), giving Blue Devil a real chance to shine once more. Finally, Blue Devil recently appeared as part of the Reign in Hell (2008-2009) mini-series. 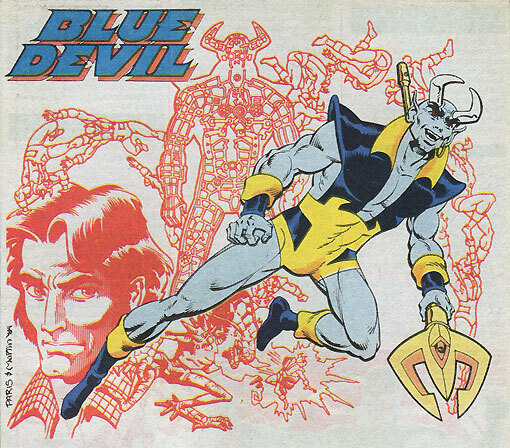 The years after the monthly series and before Days of Vengeance were not stellar for Blue Devil (1986-2005). During that era Blue Devil died no less that three times. I’m not kidding. Once in Underworld Unleashed #3 (1995), next in Starman #38 (1998), and finally in JLA: Black Baptism #4 (2001). Each time he managed to come back to life. It sort of became a running joke. Come back later this week as we cover things like: cool covers, favorite stories, supporting characters, action figures, trading cards, and Who’s Who. Even if you are not a Blue Devil fan, I think you’ll find things of interest this week. On Friday be sure to catch the very first ONCE UPON A GEEK creator interview with Dan Mishkin & Gary Cohn! ah – my favorite week of the year. look forward to digging in! This is why comic blogs are great…zero-ing in on the continuity ups and downs of obscure but awesome characters like this. Thanks and keep it up! Have been with this character from his beginning and I have always liked him. It was a sign of great writing that could so easily place the reader in the situations and adventures that Cassidy found himself in. And isn’t that why we love comics in the first place – to vicariously live the life of the heroes we love? Too many creators forget that and to parapharse Yodo – “THAT is why they fail.” I will take Dan Mishkin and Gary Cohn over your Grant Morrisons anyday. Really enjoyed the Shadownpact too and Blue Devil was a perfect fit. Looking forward to seeing some great covers and reliving some great memories all week without having to dig through my long boxes. Oh and congrats on the ‘get’ of creators Dan Mishkin and Gary Cohn. Very sweet coup my brother. An interview with Cohn and Mishkin? Tres cool!